Mention the words “night music” and I suppose the first classical piece that springs to mind is Mozart’s Serenade No. 13 in G Major, better known as Eine Kleine Nachtmusik. Contrary to popular belief, it has nothing to do with night. The literal translation is misleading because the German title means “a little serenade”. Despite its popularity today, the work is surrounded by mysteries. No one knows why Mozart wrote it. He nearly always wrote for commissions, but it’s not known who asked him to write the work or the purpose for which it was intended. Oddly enough, no one seems to know where or when it was first performed. It lay forgotten for many years and wasn’t published until 1827 – thirty six years after Mozart had breathed his last. These days, we tend to hear the work played by string orchestra but it was actually written for a string quartet with optional double bass. There’s a fine video of this original version on YouTube, given by the Gewandhaus Quartet of Leipzig, which incidentally is the oldest string quartet in the world. It was established in 1808 and has been going ever since, though not of course with the same members. 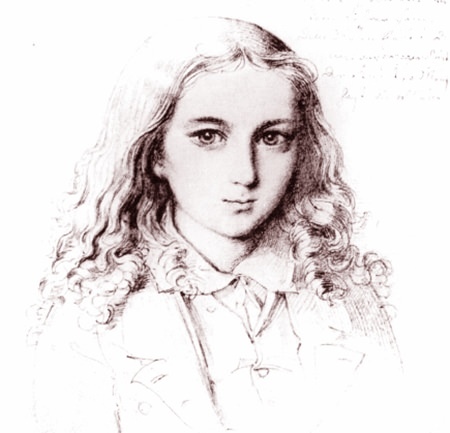 The slightly androgynous 12-year-old Mendelssohn. I can’t think of many classical works that attempt to describe night-time. There’s Mussorgsky’s Night on the Bare Mountain and Manual de Falla’s Nights in the Gardens of Spain. Oh yes, then there’s the lovely Summer Night on the River, by Frederick Delius. Beethoven’s Moonlight Sonata doesn’t count, because the music has nothing to do with the moon or even night. The sonata acquired its romantic nick-name five years after Beethoven’s death thanks to an imaginative German music critic and poet named Ludwig Rellstab. Mendelssohn was a brilliant child prodigy. The delightful string symphonies were written when he was twelve years old, and he was seventeen when he wrote this overture after reading a translation of Shakespeare’s play. The English music writer and critic George Grove (he of dictionary fame) called the overture “the greatest marvel of early maturity that the world has ever seen in music”. It was intended as a stand-alone concert overture and not until many years later did Mendelssohn write the incidental music for the same play. The famous Wedding March comes from this later work. There are some interesting connections here because the translator of the play was August Wilhelm Schlegel; the overture was completed in August 1826 and Schlegel’s brother married Mendelssohn’s Aunt Dorothea, who died in August 1839. This is a charming, evocative work and remarkable for its striking orchestral effects, such as the imitation of scampering fairy feet near the beginning. It was reported that Mendelssohn sketched out the opening chords after hearing an evening breeze rustle the leaves in the garden of the family home. After he moved to the United States in 1934, Arnold Schönberg altered the spelling of his surname to the less Germanic-looking Schoenberg. In photographs he always looks serious and intense, surprisingly perhaps for a man who evidently enjoyed watching Hopalong Cassidy movies. Although Schoenberg was born on 13th September he had a morbid fear of the number thirteen. It’s a condition known as triskaidekaphobia and one that he apparently shared with Napoleon and Franklin D. Roosevelt. Schoenberg is perhaps best-known for his invention of twelve-tone serialism, a composing technique based on a tone row, which is a particular arrangement of the twelve notes of the chromatic scale. Verklärte Nacht (“Transfigured Night”) was written before Schoenberg had developed serialism, but was controversial because of the advanced and richly chromatic harmonic language. At its first performance in Vienna in 1902, it must have left many people somewhat perplexed. Like Mozart’s Eine Kleine Nachtmusik, the work was originally written for a chamber ensemble but the composer later re-scored the work for string orchestra, which is the version most often heard today. Written in just three weeks, the work was based on a poem of the same name by Richard Dehmel, which centred on a somewhat bizarre conversation between two people walking through a moonlight forest. Schoenberg was an important music theorist and writer as well as an influential teacher of composition. He was also a competent painter whose pictures were thought good enough to exhibit alongside those of Franz Marc and Wassily Kandinsky. Schoenberg was sure that he would die during a year which was a multiple of thirteen so he must have felt relieved to get through 1950 – which is such a year. As fate would have it, he died a year later. On Friday 13th July.